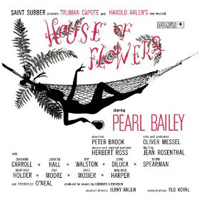 Off-Broadway Cast, 1968 (United Artists/Kritzerland) (1 / 5) Original producer Saint Subber unwisely ordered a major rewrite of House of Flowers for a new, scaled-down Off-Broadway production that yielded this cast album in shrill stereo. Here, the islanders appear more willfully ignorant than disarmingly unworldly. 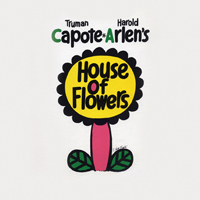 Some great songs (“One Man Ain’t Quite Enough,” “Genna Leave Off Wearin’ My Shoes”) are missing, some lackluster new ones (not entirely by Harold Arlen and Truman Capote) are inserted, and the modest calypso-band arrangements sound like toy whistles next to Ted Royal’s great originals. The musical director, Joe Raposo, plays it so safe that it sounds like he’s warming up for Sesame Street. It’s not the cast’s fault: Yolande Bavan is a charming Ottilie, Thelma Oliver and Hope Clarke are lusty sidekicks, and Novella Nelson gamely grunts out something called “Madame Tango’s Particular Tango.” Replacing Pearl Bailey as Madame Fleur, Josephine Premice is deprived of some of the character’s best material; “Don’t Like Goodbyes,’ which was evidently written for Ottilie and swiped by Bailey, is here restored to its rightful owner. Premice’s unidentifiable accent and inimitable, scratchy singing are ingratiating, but the squirm-inducing moments in this wilted Flowers far outweigh the soul-satisfying ones. If there’s an object lesson in how to ruin a classic score, here it is. — M.M.